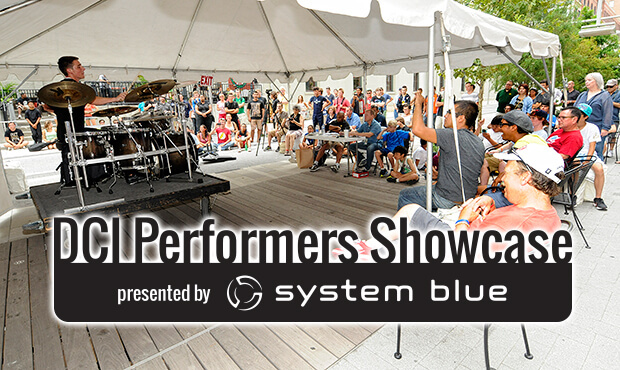 Georgia Street in downtown Indianapolis will host the 2014 DCI Performers Showcase presented by System Blue. Individuals and ensembles will once again have their day in the spotlight during the week of the Drum Corps International World Championships, when the newly named DCI Performers Showcase presented by System Blue highlights the start of Championship Week action in Indianapolis. Continuing the tradition of the Individual & Ensemble Competition of previous years, the DCI Performers Showcase will take place in the heart of downtown Indy on Wednesday, Aug. 6, from 10 a.m. to 4 p.m. ET. The event is free and open to the public. The bulk of the action will take place on Georgia Street, which after a $12.5 million renovation prior to Indianapolis hosting Super Bowl XLVI in 2012, offers a picturesque pedestrian walkway blended with shopping, restaurants and other businesses. As part of the competitive event, participating World and Open Class drum corps members will come together to demonstrate their individual and small group talents by performing solo and ensemble pieces perfected outside of their normal rehearsal schedules. Thanks to the inclusion of vocal and woodwind categories, members wishing to do so can also display their talents on instruments that are not typically used as part of DCI competitions. New for this 2014 event, age-eligible performers who are participating as part of Drum Corps International's DrumLine Battle or SoundSport divisions—whether or not they are a member of an Open or World Class drum corps—will also be given the opportunity to compete. "This year's SoundSport and DrumLine Battle groups are coming to the World Championships from as far away as Asia and South America," DCI Director of Events Susan Kuehnhold said. "The Performers Showcase will be another opportunity for these incredible international musicians and others to join the fun as they have the chance to showcase their skills against DCI's very best." The DCI Performers Showcase will be presented for the second year in a row by the Blue Devils organization's educational arm System Blue, which represents a mixture of products, live events and publishing that focus on the education and development of band directors, teachers, designers, performers and marching arts students around the world. "System Blue has long been committed to excellence in all facets of a young person's musical and dance experience," said David Gibbs, executive director of the Blue Devils and System Blue. "System Blue is very excited to once again provide the opportunity to continue this historic and long-running event in the streets of downtown Indianapolis." Learn more about System Blue. 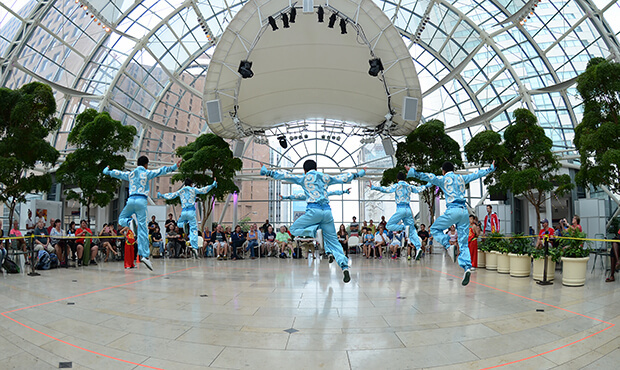 Members of Gold representing the Laizhou Zhong Hua Martial Arts School compete in the dance ensemble category in 2013. For instrumentation or ensembles currently not covered under DCI Performers Showcase rules. Registration: Participating 2014 DCI World and Open Class corps members along with eligible SoundSport and DrumLine Battle participants can register to compete as part of the event. The deadline for entries is Wednesday, July 23. A look back at many of those who competed as part of the 2013 Individual & Ensemble Championship presented by System Blue in Indianapolis. 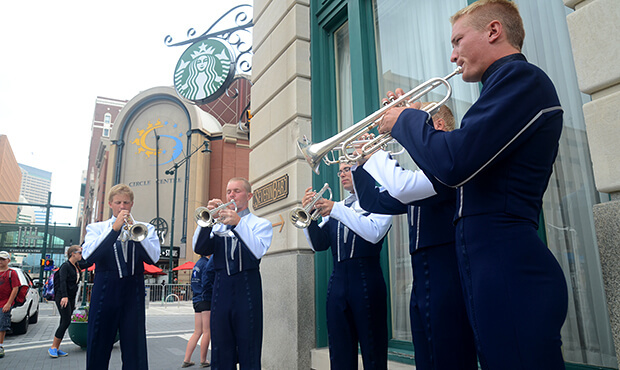 A Blue Stars brass ensemble warms up for their performance on the streets of downtown Indianapolis. With events kicking off on Monday, Aug. 4 in Michigan City, Ind. for Open Class corps, the DCI World Championships will head to Indianapolis on Wednesday Aug. 6 for the Performers Showcase and the World Championship Prelims, Semifinals and Finals Aug. 7-9. Purchase tickets to the 2014 DCI World Championships. Be at the center of all of the Championships Week action by booking your hotel room through Drum Corps International. Learn more about locations, room availability and special rates at DCI.org/IndyHotels.